The UPND has summoned its Sinanzongwe MP Richwell Siamunene for disciplinary hearing over his acts of antagonising the party. 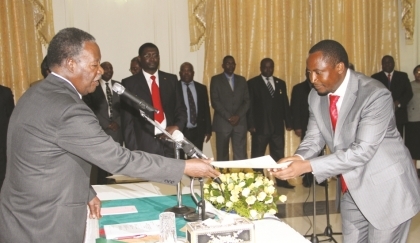 UPND deputy Spokesperson Cornelius Mweetwa said Mr. Siamunene, who is serving as one of president Michael Sata’s army of deputy ministers, should avail himself before the party’s disciplinary committee to answer charges leveled against him. But Mr. Siamunene has said he will not be available for the disciplinary hearing as he is busy with what he term ‘national duties’. Mr. Siamunene said he has no time for a party that is merely victimising him for delivering development to the people. President Sata recently gave an opportunity to all his ministers to make travel allowances by going out to explain the controversial police of increasing mealie meal and fuel which has been widely rejected in the country.